President Obama could provide the economy with a major boost and force fat-cat CEOs to pay their workers a living wage with the stroke of a pen. 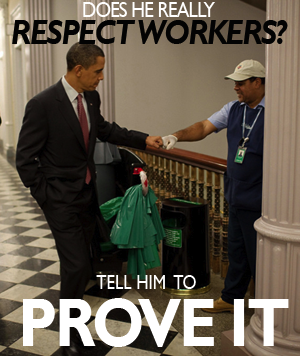 In January, President Obama declared that all Americans deserve a living wage. Now, he has the opportunity to quickly and easily make that happen for 2,000,000 Americans by issuing an executive order to require all federal contractors to comply with the Service Contract Act. Everyone knows Walmart and McDonald's employ huge numbers of low wage workers -- offloading costs like Medicaid to the taxpayers. Yet government contractors employ more workers without a living wage than these two companies COMBINED. The good news -- it's an easy fix. President Obama can do it without going through do-nothing Republicans in Congress. Add your voice to demand that government contracts shift OUR money to the workers, not to fat-cat CEOs.